In today's health conscious food markets, both in Australia and overseas, lean meat is desired as a source of quality protein, minus the high fat content that causes so many health issues. The unfashionable - and scientifically incorrect view that meat is bad for you has been replaced by an understanding that lean meat is a vital part of a healthy lifestyle. As a superb source of protein, iron and countless other beneficial vitamins and minerals, meat is back in style and for all the right reasons. And whilst lean meat is good, it can be even better when that meat comes from animals - whether sheep or cattle, that have been grazed on Oldman saltbush. The unique protein structures of Oldman saltbush, when digested by cattle or sheep (even goats) produces a very lean meat with a remarkably high protein content and a special, unique flavour that appeals to large numbers of people. The high salt content of the plant as absorbed from the soil and photosynthesized by the plant allows for the creation of high concentrations of beneficial proteins. Furthermore, you have the added advantage of drastically reduced, and in some cases eliminated, need for salt blocks. Of course, there are some markets, most notably Japan, where marbling is a very desirable attribute of meat, thus Oldman saltbush grazed animals may not be ideally suited to this particular market. 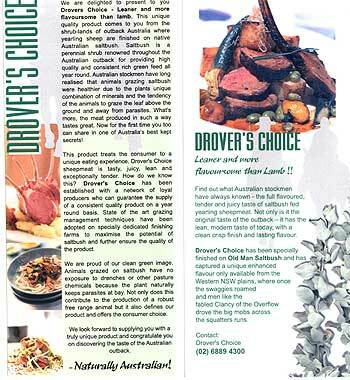 However, in the vast majority of cases, Oldman saltbush grazed meat offers real benefits to the consumer?and producer. With Oldman saltbush, you will be able to deliver to consumers a superior product that is perfectly in tune with the wishes of the health conscious buyer. Oldman saltbush forms a key part of our holistic management protocols, ones which allow you to, instead of trying to fight salinity, take advantage of it. Salt is something that, when used in the right way, permits you to create business models which can be more profitable, more robust and simply more achievable than any other. Many other approaches see salt as a perpetual problem, but with Oldman saltbush, it is an opportunity. QOTD: "Lack of planning on your part doesn't consitute an emergency on my part."